In 2014, the group shared the stage with bands such as Taake, Noctem, Valkyrja, Unearthly and representatives of native metal scene Thy Disease, Devilish Impressions, Saltus, North and many others. With the advent of 2015 the band completed mixing and mastering of the material and they focused on refining the graphic side of "Twilight of blood and flesh," as well as subsequent concerts under the auspices of the Heart of Rock Agency , which resulted in performances in various Polish cities along with Negura Bunget and Heathen Foray. In September of the same year the long awaited release finally saw the light of day. The debut LP was released by Art of the Night Productions and shortly after the band performed with Skallmold, Cruachan, Skyforger and Ensiferum. 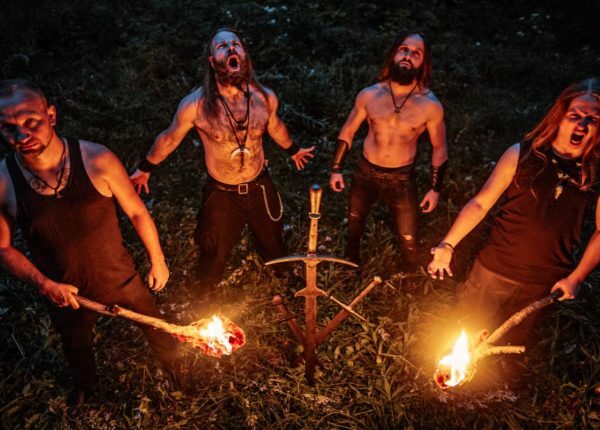 At the beginning of November Valkenrag presented their second video, for the song 'Halls of the Brave' and started a promotional tour for the LP. Together with Quo Vadis the band raided many Polish cities but as the tour was coming to an end, at the beginning of 2016, Shevcoo left the band. This unexpected turn of events forced Valkenrag to cancel the remaining dates. A few months of rehearsals later Valkenrag resumed it’s live performances by playing shows in the Czech Republic and during summer festivals in Lithuania ( Kilkim Zaibu), Latvia (Zobens un Lemmes ) and Poland (Dark Fest). During that time the band performed with such artists as like Rotting Christ or Venom. Currently Valkenrag is working on new material.